The Smoky Mountains or as they are sometimes called, “The Smokies”, refers to the Great Smoky Mountains National park and the surrounding Southern Appalachian communities which includes the popular gateway communities of Gatlinburg, Pigeon Forge, and Sevierville. The Smoky Mountains are the most visited national park in the United States with more than 11 million visitors annually. It is no wonder the world flocks to the Smoky Mountains with more than 800 miles of trails including 70 miles on the Appalachian Trail, nearly 400 miles of maintained roadway offering some of the most scenic drives in America, and a diverse population of wildlife and plant life to enjoy. In this Complete Guide To The Smoky Mountains, we share the best times to visit the Smoky Mountains, the best Smoky Mountains hikes and scenic drives, and the best things to do in the Smoky Mountains for each season. You can utilize our table of contents to navigate this guide and quickly find what you need to help you plan your Smoky Mountains Vacation. WHY ARE THE SMOKY MOUNTAINS SMOKY? Are The Leaves Changing In The Smoky Mountains Yet? The best time to visit the Smoky Mountains for Fall colors is between mid-October and November! Does it Snow In The Smoky Mountains? Is March A Good Time To Visit The Smoky Mountains? What Is There To Do In The Smoky Mountains In The Summer? HOW MUCH DOES IT COST TO GET INTO THE SMOKY MOUNTAINS? How many trails are in the Smoky Mountains? The Smoky Mountains is a mountain range located in the Southeastern United States along the border of Tennessee and North Carolina. They lie within the Blue Ridge Province of the Appalachian Mountains. The Great Smoky Mountains National Park is connected via the Blue Ridge Parkway to the Shenandoah National Park in Virginia. TODAY!! Today is the best time to visit the Smoky Mountains in our humble opinion, but if not today, soon! Okay, I’ll be a bit more specific. Here is my answer to the most commonly asked questions about when to visit the Smoky Mountains. Mid-October to early November is the best time for fall foliage in the Smoky Mountains and as such, Fall is a peak season in the Smoky Mountains. You should expect large crowds especially on the weekends. There will be road congestion and hotel rates will be at their highest. However, despite this fact, I have to confess that the fall is truly our favorite time to visit the Smoky Mountains. We’ve been at least once every year during the fall for the past 15 years and don’t anticipate changing that. Despite the larger crowds, the draw of the Smoky Mountains in the fall is too hard to resist. This is when the Smoky Mountains make their brightest debut. Yes! It does snow in the Smoky Mountains, but not always in the Winter. I like to say, we don’t expect a white Christmas but we fully expect a white Easter. That’s not entirely accurate, but in the lower elevations it can be. However, as I am writing this, we have just experienced the largest single snowfall in the Appalachian mountains in December since the 1960’s so, yes, Virginia there is a Santa Clause and sometimes it snows in the winter in the Smokies. It does snow in the higher elevations of the Smoky Mountains and several road closures do occur which we will talk more about in our section on scenic drives, but here is the lowdown on what to expect in the winter in the Smoky Mountains. Best time to visit for Christmas lights is first two weeks of December before schools let out. Crowds will be be largest from mid-November leading up to the Christmas holiday and will begin to thin after the New Year’s Day. Weekends will be crowded throughout the holiday season. After mid-January through early March will be the lowest crowds in the park, but many roads may also be closed. As I mentioned, snowfall can and often does occur in early spring, but Spring is still a great time to visit the Smoky Mountains and as the temperatures rise in late April and early May, it’s one of our favorite times because the flowers are beautiful. Crowds will be lower in the Spring, but you can expect them to swell during the Spring break weeks in March and April, but still be less crowded than in the Fall and Summer. What ISN’T THERE TO DO in the Smoky Mountains in the Summer. The second best time to visit the Smoky Mountains is often listed as the summer because the most attractions are open, but whether it’s the best time really depends upon your preferences and crowd toleration. Peak Season is June 15-August 15th. Best time to visit for most attractions & summer fun. Next to weekends in October, summer will be the second peak season for the Smoky mountains. June 15-August 15th being the busiest times. If you visit in the summer, we recommend arriving early at the most popular attractions and trails or use some of our tips for finding more off the beaten path ideas. It is FREE to get into the Great Smoky Mountains National Park. The park is one of the few national parks in the United States that does not require an entrance fee. In the 1930’s when the park was established, Newfound Gap Road was one of the major routes crossing the Southern Appalachian Mountains and was paid for by the states of Tennessee and North Carolina as well as the local communities. When the state of Tennessee transferred ownership of the land to the Federal Government, they stipulated that, “no toll or license fee shall ever be imposed…” to use the road. Therefore, there is still no fee to this day to enter the park. Read more on the NPS website. As with any vacation destination, there are certain things that make that location unique and are considered “must do” activities. Here is a list of things we feel should not be missed on a Smoky Mountains Vacation (if at all possible) no matter when you visit. This is just something you have to do at least once when you visit the Smoky Mountains. There is something truly special about staying in a rustic log cabin tucked away in the hills of Tennessee. Our preference, as we mentioned already, is to stay in the Fall, but winter can be pretty special as well. A soak in the hot tub on your deck as the snow is falling followed by hot chocolate by the fire sound like my kind’ve dream vacation if you ask me. You just have to hike to a waterfall or two or three when visiting the Great Smoky Mountains National Park. It’s something everyone needs to do at least once. We will share in more detail below some great Smoky Mountain Waterfall hikes for you to explore. I have been visiting Dollywood since it was Silver Dollar City (Yes, I just dated myself). I can say with 100% honesty that Dollywood gets better and better with the passing years. Dolly Parton has managed to preserve the charm of the Smoky Mountain theme park for us old fogies, while continuing to add thrilling attractions and new festivals to appeal to all ages. You have to check it out at least once! This particular drive is a Great Smoky Mountains National Park MUST DO for anyone who wants to get the best the Smoky Mountains has to offer. The 11 mile loop drive circles the cove that houses several historic buildings dating back to the settlers in the area and it is filled with wildlife (including Black Bear which will help you mark off another on this list of 10 Things Not To Miss if you catch a glimpse). If you’d like a guided tour through Cades Cove, check out this bus tour. Not much to explain here! Just do it! Unless you don’t enjoy 360⁰ views from a 400 foot tower, then skip it! Speaking of heights, this is another must do in Gatlinburg. The Gatlinburg Aerial Tramway will take you and 119 of your closest friends (or strange tourists, whichever you prefer) to the Ober Gatlinburg Ski Resort where you can ride an Alpine Coaster, go Ice Skating, or grab a snack and just enjoy the views. Okay, I’m going to be up front on this one. I HATE the Gatlinburg Trolley! I know, I know, why am I putting it on the list. Well, for the same reason you don’t go to New York city and skip Time Square. You just have to do it if you want to experience the Smokies. Seriously, the Trolley can be a great way to get around (and a cheap way as well). I just don’t recommend you head out on the Trolley with a real tight schedule if you catch my drift. There is one time per year that riding the Trolley at a leisurely place is special. Read more about the Winterfest Trolley Tour Of LIghts. You just gotta have some Smoky Mountain Pancakes. There are numerous, I repeat, NUMEROUS pancake houses in Gatlinburg and Pigeon Forge and all of them are pretty great. The Pancake Pantry is probably the most well known, but there are many great restaurants in Gatlinburg and Pigeon Forge to try. Check out our Best Restaurants in Gatlinburg to get a few ideas. Finally, if at all possible, you gotta try to see a Black Bear when in the Smoky Mountains. We already mentioned Cades Cove is a great place to start, but there are many great scenic drives that might afford you a glimpse of one. Of course, be wise on the trails and DON’T FEED THEM please!! Check out this page for tips on what to do if you encounter a black bear in the Smoky Mountains. Hiking in the Smoky Mountains should be at the top of your list of things to do when you visit the Smokies. Even if you aren’t an avid hiker, there are plenty of trails and recently mapped out quiet walkways accessible to everyone. There are more than 522,427 acres within which there are more than 800 miles of trails to hike in the Smoky Mountains. There is sure to be a trail for you. Since there are more than 75 different trails in the Smokies, a comprehensive list would be beyond the scope of this article, but we wanted to give you a taste for some of the best hikes in the Smoky Mountains to check out in each season. Hiking during the fall is one of the best ways to see the beautiful fall foliage and, on some trails, escape the crowds. In the higher elevations, colors may begin to show as early as mid September, so you will want to hike to the top for the best views. As the season progresses and the peak mid-October leaves show, you can choose a mid-level to low-level elevation hikes. This trail takes you to the 6,000 foot ridgeline of the Appalachian mountains and will give you everything you want in a hiking trail. That is if what you want is a great workout, great views, and plenty of solitude. The trailhead is accessed from the Newfound Gap Road parking area and takes you to what seems the very ridge of the Appalachian mountains affording numerous glimpses of Mount LeConte, Charlies Bunion, and Mount Guyot. Be sure to pack your bag with all the essentials for a long day. This famous hike was, unfortunately, damaged by the 2016 wildfires and remained closed after the fires for 10 months. Reopened in October 2018 with a new viewing platform and a shorter route, the pinnacles are still closed due to instability. The trail is between 3,300 and 4,800 feet in elevation making it ideal to enjoy in late October. If you’d like a smaller crowd, but a serene and scenic hike, we recommend hiking the Middle Prong trail in Tremont. While there are no mountain vistas, the wide path that runs alongside the stream through the hardwood forest with its falling yellow and orange leaves is most majestic in the fall. The trail runs along the old railroad track used by the Little River Company in the early 1900’s to haul lumber. There is a fascinating history about this area and the people who lived in Tremont Lumber Camp. The forest that stands today is a small glimpse of the forest which was logged and harvested in the early 1900’s, but it is still a beautiful trail. There are three waterfalls on this 8 mile hike, and even if you only hike a short way in and back, you will be awarded with a wide open trail, a pleasant stream, and with plenty of nooks and crannies to explore with the family. If you are looking for some larger waterfalls in the fall, Ramsey Cascades are the largest in the park, cascading 100 feet over the rocks and splashing into a pool below. This is a strenuous hike gaining 2000 feet in elevation and is 8 miles round trip. Plan on this for the day and prepare accordingly. Hiking the Smoky Mountains in the Winter can be a pleasant experience. There are numerous easy to access trails to hike in the winter where you can enjoy frozen waterfalls and ponds, sightings of white tailed deer and other wildlife, and you might even enjoy several sunny days with temperatures in the 50’s. Prepare accordingly with warm clothing, and perhaps microspikes or trail crampons on your hiking boots. Also, be careful of falling icicles and always be prepared should you encounter bear or other wildlife on the trial. Here are a few Smoky Mountain hiking trails we recommend for winter. This paved 1.3 mile out and back trail leads to a cascading 80-foot waterfall. The trail has a slight incline and is bumpy in areas, but completely paved and should be relatively easy for most people. If the conditions are particularly icy, the trial may be slippery and does narrow in areas so use extreme caution. While it is unlikely that the waterfall will be frozen, it is still a beautiful sight to behold. Bear are often seen on this trail so please behave accordingly. Never approach or feed any wildlife in the area as this only leads to danger for you and could lead to the euthanasia of the bear. Read more here about how to behave if you encounter wildlife on the trail. This is a great trail in any season, but the winter can be especially beautiful. This moderate hike begins with by crossing Walker Camp Prong and Alum Cave Creek on log bridges through an enchanting old-growth hardwood forest. The bluffs are 2.3 miles from the trailhead and gains 1200 feet in elevation. The water that drips from the bluffs throughout the year is often frozen during the winter months rewarding hikers with a beautiful cascade of icicles throughout the hike and underneath the bluff. Andrew’s Bald is accessed via a 3.6 round trip trek on the Forney Ridge trail from the Clingman’s Dome parking lot, Andrews Bald is a great place to see the snowy mountain tops that often mark a Smoky Mountain Winter. This is an easy to access trail in the winter due to its lower elevation. The road to get there is rarely closed in the winter. There are several historical buildings, a farmstead, and a cemetery for those who enjoy seeing the remnants of the settlers of this area. At about 2 miles you will see Fern Branch Falls which is often frozen in the winter. Hiking on one of the 150 Smoky Mountain trails in the Spring is always a great idea! You will be rewarded with beautiful wildflowers and great waterfalls. Consider joining the Spring Wildflower Pilgrimage in the Great Smoky Mountain National Park. This trail is often included in the Spring Wilflower Pilgrimage and for good reason. Cucumber Gap Trail is located in the Elkmont Camp area and is loaded with wildflowers in the Spring. Painted trillium, Dutchman’s Pipe, yellow-wood and papaw can all be seen along the trail. The elevation change is around 400’ for this 5 mile moderate hike. Another great trail included in the Spring Wildflower Pilgrimage, Huskey Gap Trail is 4.2 miles round trip with a trail has a gradual elevation gain of just under 1300 feet. Allow 2-3 hours for Grotto in and out. Wear good trail shoes and take plenty of snacks. Grotto Falls is a beautiful 25 foot waterfall located 1.5 miles in on Trillium Gap Trail in Roaring Fork. The trail actually runs behind the falls making it a truly unique and enchanting experience. Hiking in the Smoky Mountains in the summer is one of the best ways to beat the heat. Every trail we have mentioned in the above sections would be acceptable to also visit in the summer, but here are a few more ideas to beat the heat you might want to add to the list. This is not an easy hike, but for those willing to climb the 11.6 mile out and back trail to the summit of Gregory Bald in the summer, the reward is worth it. Sitting at 4,949 the views are spectacular, but in mid to late June the mountaintop is set aflame with the color of blooming azaleas ranging from fire red, to orange, to salmon, yellow and pink. It is said the azaleas bloom on Gregory Bald is credited with helping establish the Great Smoky Mountains National Park. A horticulturist named Harlan Kelsey who was on the committee charged with developing National Parks in the East noted the azalea bloom on Gregory Bald as one of the finest in all the nation and worth preserving. is found at the end of a 2.7 mile moderate trail (5.2 miles in and out) and is the highest single drop waterfall in the Smokies. Very popular strenuous hike in and out hike. Allow 3-5 hours. We recommend you wear excellent hiking boots and even consider a set of trekking poles if it’s wet as the trail can become slippery in parts especially after a lot of rain. Clingmans Dome is one of the most popular and, yes, very likely crowded, hikes to do in the Smoky Mountains. The very steep paved, yet not too technical, trail takes you up to an observation tower where you can see as far as 100 miles on clear day from atop the highest point in Tennessee. Many people think the observation tower is Clingman’s Dome, but it’s actually the 6,643 foot mountaintop that lies within both Tennessee and North Carolina upon which the observation tower is built that is the “dome”. If you are looking to take a break from hiking, don’t worry, The Great Smoky Mountains National Park has nearly 400 miles of paved or well-maintained gravel roadway for you to enjoy many of the most scenic places in the Smoky Mountains from your car. Here are 7 of the best scenic drives to explore in the Smoky Mountains throughout the year. Note that only Newfound Gap Road, Cades Cove, and Little River remain open year round, so be sure to check the National Park page for Seasonal Road Closures. This 11 mile loop drive circles around a cove filled with wildlife and historical buildings. It isn’t uncommon to see turkey, raccoons, groundhogs, deer, and yes, even black bear while driving through Cades Cove. There are numerous pullover sites where you can picnic, take a short hike, and explore some historical artifacts and buildings. Cades Cove was hunted by the Cherokee for thousands of years, but the first Europeans settled in the area between 1818 and 1821 and the population grew rapidly. Along the drive you can view three historic churches, a working grist mill, and many restored buildings from this fascinating era of our nation’s history. Cades Cove is no secret, however, and the drive can be rather slow especially if wildlife is spotted. There are very few ways to “go around” the cars in front of you, so we recommend arriving early and plan on spending a minimum of two to four hours. Take a picnic lunch and take it all in at the slower southern pace of its mountain ancestry. If you are looking for a real treat and want to avoid the insane crowds of Cades Cove, you should definitely check out Cataloochee Valley. This area has become a favorite for those looking to get away from the crowds though we aren’t sure how long that will last as the word gets out. A wonderful time to drive to Cataloochee Valley is from mid-September to late October when you can enjoy hearing the bugling Elk which are in rut (mating season). Accessing this area does require driving on a winding 11-mile mountainous road, but it is well maintained and accessible to passenger cars. Newfound Gap Road is quintessential Smoky Mountains! Also known as hwy 441, this 33 mile stretch of paved road leads from the north entrance of the Smoky Mountains in Gatlinburg southward toward Cherokee, NC. The major points of interest along Newfound Gap Road include the Newfound Gap overlook, Clingman’s Dome, and the Rockefeller Memorial site where former President Franklin D. Roosevelt formally dedicated the park on September 2, 1940. Be sure to leave time for exploring a bit of Cherokee, NC and perhaps take in their outdoor theatre to learn more about the history of the Cherokee Tribe that once roamed this area. As I previously mentioned, there are two great hiking trails located along the Roaring Fork Motor Trail, but if you aren’t up for hike, this autotrail is a favorite drive for the Springtime. Roaring Fork is a fast flowing mountain stream that runs along the trail and is apt to be “roaring” during or after a hard rain. I love visiting this trail in the spring because the lush green colors and cool shade of the trees has an enchanting effect. Just before you enter this natural fairyland, take time to explore the Noah “Bud” Ogle nature trail and farmstead. We really enjoy rolling down the windows to take in the scenery and nature’s air conditioning. The Foothills Parkway is a 72-mile stretch of highway with a western section extending 33 continuous miles from Chilhowie Lake to Wears Valley and an eastern section extending from Cosby to Interstate 40. The completion of the highway was celebrated in November 2018, when the so-called “missing link” of the Foothills Parkway was completed. We were able to visit the weekend it was opened and enjoyed the vast views of Wears Valley and other parts of the Smoky Mountains. This is sure to become a go-to destination for fall foliage that rivals the nearby Blue Ridge Parkway. This primitive and easily accessible road is an alternative exit from Cades Cove. It is a 7-mile one way gravel road that will lead you along a winding path north toward the quieter sides of the Smoky Mountains into the town of Townsend. There is a scenic overlook where you can get a picture of the Primitive Baptist Church below in Cades Cove. The road is seasonal only open from Mid-April to November so summer is a great time to check it out. As you have probably already discovered throughout this guide on things to do in the Smoky Mountains, every season has its own special magic. Whether it be hiking, scenic drives, or attractions, there are things not to miss in every season and special festivals and attractions that keep you wanting to visit the region throughout the entire year. Here are a few of our favorite Smoky Mountain Attractions and ideas on when to visit them. In addition to the beautiful Fall Foliage in the Smokies, these attractions are some of our favorites to visit during the Autumn season. Visit the Gatlinburg Convention center for the Fall Craftsmen’s Fair to get a truly unique souvenir from one of the area’s many talented craftsmen and women. This is such a fun event in Gatlinburg during the fall. It’s a great excuse to enjoy a ride on the Gatlinburg Aerial Tramway up to the area’s Ski resort, Ober Gatlinburg. Ober is transformed into a simulated Munich, Germany during Oktoberfest complete with bratwurst and of course, great beer! In addition to great beer and German food, Ober’s Oktoberfest has crafts and rides for the kids. The ice-skating rink and mountain coaster are open as well. Fun will be had by all ages at this October event in the Smokies. If you are looking to try something a little harder than the great German Beer at Oktoberfest, check out the new Grains and Grits Festival hosted by local whiskey and moonshine distilleries in Townsend, TN. This over 21 only foodie and craft spirits festival kicks off in early November. Is there a more iconic way to enjoy the Smoky Mountains than from a rail car? We think not! The Great Smoky Mountain railroad offers a chance to step back in time and enjoy the fall foliage from the comfort of the train as you whisk through the mountains on steam locomotive. The journey will take you through the Carolina Mountains which make up more than 50% of the Great Smoky Mountains and borders the western edge of North Carolina. For a truly special treat consider booking the PEANUTS™ The Great Pumpkin Patch Express or the Polar Express Train Ride for Christmas. Get All These Attractions for one Great Price with The Smoky Mountains Attractions Pass! Winter is a special time in the Smoky Mountains. From late fall until after the first of the year, Winterfest is underway and the sights and smells of the Christmas season are in full force. There are more than 10 million twinkling lights throughout the Smoky Mountain area in Gatlinburg, Pigeon Forge, and Sevierville. Dollywood alone has more than 5 million Christmas lights thanks to its newly expanded Glacier Ridge. Snowfall in the lower levels of the Smoky Mountains is minimal with low accumulation about five times per year. Higher elevations and several of the more shaded and narrow roadways do become snowy and icy and will be closed. Check the National Park Page for road conditions and closures. Tennessee’s only ski resort shines its brightest during the winter months, but don’t think skiing is the only winter time activity to enjoy. In addition to the 10 slopes for skiing, Ober offers snowboarding, tubing, and an indoor ice skating rink. Instruction is also available. There are so many special shows to take in during the winter holiday season from Dolly’s Christmas at the Dixie Stampede to Christmas at the Smoky Mountain Opry the options are endless. 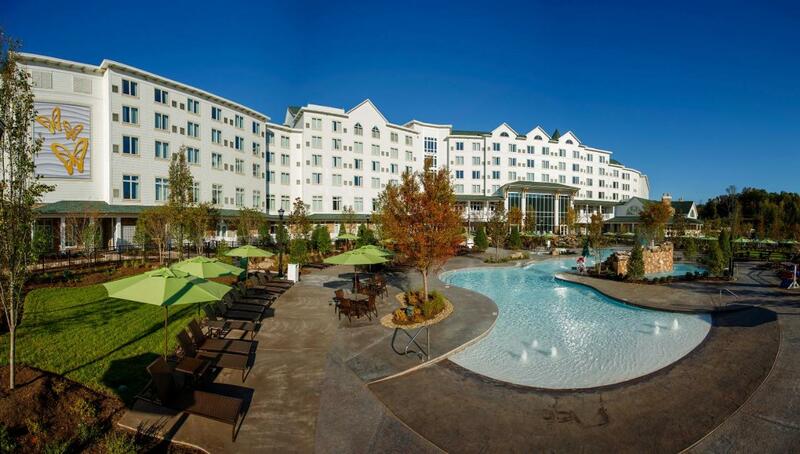 Usher in the New Year with a celebration at The Island in Pigeon Forge, TN. Enjoy a late dinner followed by music, attractions, and a midnight countdown and firework show. While you are there, take a spin on the Smoky Mountain Wheel for a truly unique perspective. As you can imagine, the spring is a great time for visiting the Smoky Mountains. The air is fresh and fragrant with the smell of freshly blooming wildflowers, the streams and rivers are bursting forth, and the wildlife and singing birds begin to emerge adding to the magical feeling in the air. Here are a few of our favorite Springtime attractions to see in the Smoky Mountains. The Festival of Nations at Dollywood occurs in the Spring bringing together food, shows, music, and artists from nations all over the world in this one of a kind annual event. Bundle your Dollywood Tickets with other attractions to save money. Every April and May on Friday and Saturday evening, local musicians and artisans take to the downtown streets to share their craft with visitors. Step back in time with this Smoky Mountain cultural treat. Every spring more than 10,000 trout are released into the 20 miles of streams surrounding the Smoky Mountains for a 2 day tournament complete with cash prizes. Bring the kids because there is even a separate youth tournament. Do I really need to say anything else? Enjoy this adult oriented weekend with tours of the local wineries on Friday followed by a Saturday evening of food pairing and wine tasting at several booths located at the historic Arrowmont School of Arts and Crafts. Tickets include a free souvenir wine glass to take home. Summer is, of course, one of the best times to visit the Smoky Mountains as all activities both indoor and out will be in full operation. The temperatures do heat up and humidity is high in the lower elevations, but that’s all the more reason to head for the hills of northeast Tennessee and reach those higher elevations and cooler temperatures. Here are a few ideas for how to best spend your summer in the Smoky Mountains. This is definitely the place to be in the summer to cool off and have some great thrills with the family. You might even consider booking a package at Dollywood’s Dreammore Resort to enjoy both parks and an amazing resort family vacation. Gatlinburg is home to several regional rivers including the Pigeon River offering class III and class IV rapids for those looking to get a little wet on their visit to the Smoky Mountains. Never been on a whitewater rafting expedition before? No problem! There are several outfitters in the area who are more than willing to assist you and your family. Pigeon River rafting is perfect for all skill levels. The upper Pigeon River is for the more experienced, but the lower Pigeon River provides a more relaxed and unique way to see the beautiful smoky mountains. This is a really fun way to explore the Smoky Mountains in the summer. It is an excellent way to explore Cades Cove in the summer because the park closes it to motor traffic on Wednesday and Saturday mornings until 10 am. This is a brand new way to cool off and have some fun in the summer in Pigeon Forge. Pigeon Forge is now home to the only indoor snow tubing facility in the United States. With temperatures constantly between 60-70 degrees all year and REAL SNOW to tube down, this one you have to try out! A new and more unique way to explore them there hills, is on a smoky mountain Alpine coaster. Don’t underestimate these a “hillbilly” mountain coasters! These downhill gravity driven bobsleds are not as tame as you may think. They can be quite exhilarating as you speed down the mountain on a railway bobbing and weaving in between the trees and shrubs. We’ve enjoyed Goats on the Roof several times! There are so many outdoor Summer adventures to be had in the Smoky Mountains. Have you ever wanted to ride an ATV through the mountains? You can do just that at Bluff Mountain Adventures. We have a whole list of other outdoor activities for you to check out over on this post–> Smoky Mountain Outdoor Adventures that should definitely be on your bucket list. Be sure to subscribe to our Newsletter where you will continue to receive up to date posts on the Smoky Mountains as well as other outdoor adventures in the Southeast Appalachian Mountains. Pingback: 10 Historic Places near Gatlinburg to Check Out on your Next Trip! Pingback: Smoky Mountain Outdoor Adventures That Shouldn't Be Missed! What a beautiful area and I would love to visit. So neat there are so many waterfalls, hikes, and scenic drives. Gatlinburg sounds like a fun town too. Thanks for sharing on #TheWeeklyPostcard. I never realized there was so much to do in the Smoky Mountains! Everything looks like so much fun! I would love to visit during the Autumn! Thanks for sharing on #TheWeeklyPostcard! Hi Julie, That’s great. I hope it was helpful. I have lived 2 hours from Gatlinburg/Pigeon Forge my whole life and spent many childhood (and adult) vacations there so if you have any questions feel free to shoot them my way, I’d be happy to help. I’m hoping to travel to Gatlinburg and the Smokies this summer with a friend. I am going to keep a list of your suggestions and hopefully get to do a few of them. Thanks for the ideas.